Ousmane Boukar is a Cowpea Breeder at IITA-Kano Station. Ousmane obtained a BSc in Agronomy from the National Advanced School of Agriculture in Cameroon in 1988, and his MSc (1998) and PhD (2002) from Purdue University. 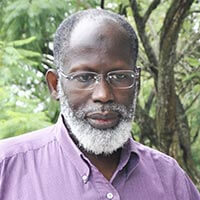 Prior to his appointment with IITA, Ousmane was a cowpea breeder and regional scientific coordinator with IRAD. He is Cameroonian.